We’d love your help. Let us know what’s wrong with this preview of Bridges of Paris by Michael Saint James. Now on sale at Amazon.com! The ideal gift: an award winning, large-format coffee table book, with over 350 original color photographs, which casts new illumination on the City of Light. The famous love-locks of Paris, are portrayed at the peek of their glory, along with stunning portraits of each bridge and intimate riverside moments. Discover the unique history of every b Now on sale at Amazon.com! The ideal gift: an award winning, large-format coffee table book, with over 350 original color photographs, which casts new illumination on the City of Light. The famous love-locks of Paris, are portrayed at the peek of their glory, along with stunning portraits of each bridge and intimate riverside moments. Discover the unique history of every bridge crossing the Seine. Once you've experienced this river tour, you will never see Paris the same way again. Living as a Parisian for a year, author Michael Saint James left his American lifestyle to immersed himself in French culture and search out a fresh view of this celebrated travel destination. The result is a visual treasure to share with everyone. To ask other readers questions about Bridges of Paris, please sign up. The day I received the large package that contained this gorgeous coffee table book, we oohed and aahed the minute we opened the package and began looking through this impressive book. The 14 X 9.5 inch book is large, heavy, and filled with 355 original stunning photographs of the 37 bridges of Paris from different positions and times of day. All the photos are in full color. If you've never been to Paris before, like me, you are going to want to hop on a plane after reading this book and enjoyi The day I received the large package that contained this gorgeous coffee table book, we oohed and aahed the minute we opened the package and began looking through this impressive book. The 14 X 9.5 inch book is large, heavy, and filled with 355 original stunning photographs of the 37 bridges of Paris from different positions and times of day. All the photos are in full color. If you've never been to Paris before, like me, you are going to want to hop on a plane after reading this book and enjoying these photos. I was so shocked when I received this book. It was incredibly huge, this is not your everyday coffee table book! However, I was not in the least disappointed. First of all, who does not like Paris and the romance of the city. I know I do and hope to visit there some day. I loved that the author immersed himself in the culture by photographing something that most people would not think to photograph, the bridges. The photos were incredibly vibrant and drew me in to the scenes of each one. He capti I was so shocked when I received this book. It was incredibly huge, this is not your everyday coffee table book! However, I was not in the least disappointed. First of all, who does not like Paris and the romance of the city. I know I do and hope to visit there some day. I loved that the author immersed himself in the culture by photographing something that most people would not think to photograph, the bridges. The photos were incredibly vibrant and drew me in to the scenes of each one. He captivated them with an eye that only he probably could do. I loved that he included history in the book and his own unique perspective. I enjoyed that the book was done by location as well. Now, I want to go see what he saw. This book will be sitting on my coffee table for a long time so that others can enjoy it too. 5 stars for a beauty to behold! My first reaction when opening this book was "WOW!" Seriously, the front cover it self is so pretty that I would pick up this book just for it. As you might be able to tell the book is a long side was book. When I was given the opportunity to review this I was not expecting much to be honest. I have looked at several coffee table type books and for me I was not impressed enough to buy any with the exception of possible two or three. For one I do not have a great place to display them as well as My first reaction when opening this book was "WOW!" Seriously, the front cover it self is so pretty that I would pick up this book just for it. As you might be able to tell the book is a long side was book. When I was given the opportunity to review this I was not expecting much to be honest. I have looked at several coffee table type books and for me I was not impressed enough to buy any with the exception of possible two or three. For one I do not have a great place to display them as well as the fact I always have little ones around and for the price of many I just would not buy one. Are you a budding or professional photographer who enjoys perusing the photographs of other artists to see what you can glean from their craft? Are you a seasoned or arm-chair traveler who has a love and passion for Paris and would like to see a side of the city from an unusual perspective? Do architecture, history and culture fascinate you? If so, then Bridges Of Paris by Michael Saint James is a book that you will want to add to your library! Bridges Of Paris isn't an ordinary book: it's a large-f Are you a budding or professional photographer who enjoys perusing the photographs of other artists to see what you can glean from their craft? Bridges Of Paris isn't an ordinary book: it's a large-format coffee table book filled with over 350 spectacular color photos that focus on the 37 bridges that cross the Seine River - bridges that connect the unique neighborhoods of France. The first bridge of our photographic journey takes us back in time to the days before Julius Caesar. The last bridge of our tour is the first bridge built in the new millennium. All of the photographs were taken by American photographer Michael Saint James, who was asked by an art student, "Which is your favorite Paris bridge? Realizing that he did not have a good answer to this question, Michael decided to take what he calls "a classical mythological journey [as] an American artist in Paris" and set aside an entire year immersing himself in French culture to discover his authentic artistic self. During that time, he studied each bridge and sought to capture the essence of each in their many different facets. As a result, Bridges Of Paris is a labor of love that is filled not only with stunning photographs that capture the heart and soul of Paris in all of its splendor and facets, but also with facts, fancy - even poetry! The book is well organized. The Table Of Contents is divided into four sections: Island Bridges, Palace Bridges, Downtown Bridges and Upstream Bridges, with each of the bridges identified for your convenience. The book also contains Maps, an Index, and a Bibliography for those seeking more information on the topic. Bridges Of Paris is one of those books that you not only enjoy pouring over, but you will also want to proudly display in your home. It is the perfect gift for business associates and those impossible-to-please people on your gift list. To read this review in its entirety, visit Create With Joy. 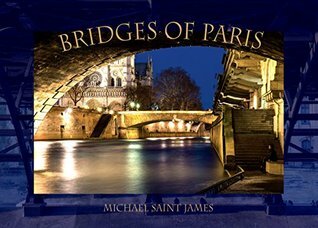 Bridges of Paris by Michael Saint James is a very highly recommended absolutely gorgeous collection of 355 photographs in a large format coffee table book. Everyone who has walked through my living room has been totally enraptured for weeks by the photographs in this book. Michael Saint James includes all the information and organization I could possibly wish for along with the photos. You need to visit his website for a taste of the book, photos, and the list of bridges. He opens with an introdu Bridges of Paris by Michael Saint James is a very highly recommended absolutely gorgeous collection of 355 photographs in a large format coffee table book. Everyone who has walked through my living room has been totally enraptured for weeks by the photographs in this book. Michael Saint James includes all the information and organization I could possibly wish for along with the photos. You need to visit his website for a taste of the book, photos, and the list of bridges. He opens with an introduction and then a historical panorama of the building of the bridges. The bridges are organized by Island Bridges, Palace Bridges, Downstream Bridges, and Upstream Bridges. Included are maps of Paris, an index, bibliography Then we get to the pages and pages of luscious photographs. At the beginning of each section you will see a satellite map showing and naming all the bridges. Then the individual bridge is named again on another satellite map at the opening of the section for that specific bridge. Vital statistics are included: when the first bridge in this location was built, when the current bridge was opened, the length, width, how many arches, and what the bridge is used for -pedestrians and/or traffic and a brief history. It is absolutely an ideal way to present and organize the information and the photos of the bridges. There is one small photo of the author crossing the first bridge on the Seine near Source de la Seine in Burgundy that found delightful, although it's not officially a bridge in Paris. Truly Bridges of Paris captures la joie de vivre (the joy of life). Just a note in passing: Normally review copies are rather plain. The covers may not be final yet, sometimes photos and maps are simple noted with a place holder. I usually file them out of sight on a bookcase near my desk before reading them. I was surprised to receive an exquisite review copy of Bridges of Paris, with an impressive cover photo and then full of pages of gorgeous color photographs. I immediately placed it on my coffee table, with the thought that such a beautiful book with such sumptuous photographs was meant to be shared. It was a magnet for everyone who walked in to the room and I lost count of the number of times I heard the words "gorgeous photos!" Warning! This book will give you the travel bug! I've never traveled outside my little Southern world, and most of the time I'm okay with that. I'm baffled how planes stay in the sky, and I'm terrified of them. Why on earth would I want to get on one?! ;) Every once in awhile, though, I get the urge to travel out of my little cocoon and see the world. Bridges of Paris gave me that urge. It made me dream of seeing the beauty up close and in person one day. As I was admiring the book one night, m Warning! This book will give you the travel bug! I've never traveled outside my little Southern world, and most of the time I'm okay with that. I'm baffled how planes stay in the sky, and I'm terrified of them. Why on earth would I want to get on one?! ;) Every once in awhile, though, I get the urge to travel out of my little cocoon and see the world. Bridges of Paris gave me that urge. It made me dream of seeing the beauty up close and in person one day. As I was admiring the book one night, my husband asked me what I was doing. "Dreaming of traveling one day." In the meantime, though, I've been enjoying looking through this gorgeous book, and learning more about each of the bridges. This is a large coffee table kind of book. It's much wider than even the average large book, making the pictures bigger, and even more admirable. There are various photos of the featured 37 bridges. You might see the bridge from a distance, or up close, in the daytime, or at night, from above or from below. You'll see multiple photos of each one, to get a greater appreciation of the beauty. Not only do you get to see lovely photos of the bridges, but you also get to learn more about each one. This is really so much more than just a photography book. You'll also get a great deal of history surrounding each bridge. While the bridges are gorgeous, I've also enjoyed looking at the people within the photos, and even the transportation. I love watching people and the expressions on their faces and their body language, and guessing what they might be thinking or doing. I've enjoyed getting to see everyday life of the residents of Paris and the tourists, both in connection with the bridges. It's fun guessing which one is which. Ultimately, this is a book about bridges, but there's many layers within each photo that could be studied and admired. In case you can't tell, I've highly enjoyed this book, and imagine I will continue to do so. If you want to enjoy a bit of Paris, give this book a try. It's definitely a treasure! *I was provided a review copy, in exchange for my honest opinion. Bridges come alive through the camera lens of photographer Michael Saint James in his recent coffee table book release, BRIDGES OF PARIS. This beautiful book begins with a two-page illustration map layout of Paris giving readers an overview of where all the featured bridges are located. The bridges are listed in four categories: Island Bridges, Palace Bridges, Downstream Bridges, and Upstream Bridges. There is also a Map of Paris index and a bibliography about the author/photographer. This elegant Bridges come alive through the camera lens of photographer Michael Saint James in his recent coffee table book release, BRIDGES OF PARIS. This elegant hardcover book includes a history of bridges. The breathtaking aspect, however, are the amazing vivid, color photos of the 37 featured bridges. The photos show the bridges in daylight and at night, with people and without, as well as close-up shots of some of the unique architectural features of the bridges. The rich photos give the viewer the sense of being there in the moment James captured the image. The book highlights the issue of love padlocks and how they began. It also explains the problems the locks cause as a single grate on a bridge can weigh an additional 330 pounds when the locks are added. It points out the Pont des Arts Bridge had a section of its fence to collapse in June of last year under the weight of love locks. This gorgeous coffee table book is a perfect gift for anyone who loves France, bridges or just enjoys looking at beautiful photography. The hardcover is handsomely done making it an added bonus to leave on display for everyone to enjoy. James captures the bridges, but also the lives of those who venture onto the structures. Through the photographer’s detailed photos, the BRIDGES OF PARIS envelopes the viewer into the magical world of France and its outstanding architecture. BRIDGES OF PARIS is an amazing collection of bridge photographs that takes the viewer on a scenic tour of Paris unlike any you’ve ever seen. I am very happy to have this amazing hardcover book, Bridges of Paris by Michael Saint James for review and to offer a giveaway contest (via iRead Book Tours). This is a beautiful, large ( 14" x 9.5", 280 page) color photographic collection featuring the 37 bridges that cross the Seine River in Paris. An integral part of these photographs are the surrounding landscapes, tourists and Parisians. During his one year sojourn to Paris, author, Michael Saint James, captures multiple images of each brid I am very happy to have this amazing hardcover book, Bridges of Paris by Michael Saint James for review and to offer a giveaway contest (via iRead Book Tours). This is a beautiful, large ( 14" x 9.5", 280 page) color photographic collection featuring the 37 bridges that cross the Seine River in Paris. An integral part of these photographs are the surrounding landscapes, tourists and Parisians. Each bridge has a page or two with interesting descriptions about the bridge, it's history & geography and a helpful aerial map showing location. This list that I've created is not all inclusive, but if you are interested in any of these categories, this book is for you. Below, from the author's website, are links to some (not all) additional images. I would like to thank the author, Michael Saint James, iRead Book Tours and the publisher Citron Bay Press for providing me with Bridges of Paris, free of charge, for review. This book is amazing! The photography is gorgeous, the colors... fabulous, everything about this book is absolutely stunning! The quality of the book is superb. This book arrived this morning and I literally could not put it down from the second I opened the cover. This is the most beautiful book I have ever owned! I visited Paris last summer and really enjoyed seeing the beautiful bridges along the Seine River. This book captures the essence of Paris perfectly! If you have had the chance to visi This book is amazing! The photography is gorgeous, the colors... fabulous, everything about this book is absolutely stunning! The quality of the book is superb. This book arrived this morning and I literally could not put it down from the second I opened the cover. This is the most beautiful book I have ever owned! I visited Paris last summer and really enjoyed seeing the beautiful bridges along the Seine River. This book captures the essence of Paris perfectly! If you have had the chance to visit this beautiful city, then memories will flood back as you look through this beautiful book. If you have not been to Paris, then looking at these stunning photos will make you feel as though you have. Not only are the photographs gorgeous, but there is also a lot of history on the Paris bridges that fill this book. The author/photographer shares a tremendous amount of information on the bridges. There are 37 bridges highlighted in this book divided into four separate groups, Island Bridges, Palace Bridges, Downstream Bridges, and Upstream Bridges. I especially liked the photos of the Pont des Arts bridge, also known as the love-lock bridge, which shows the thousands of locks that have been attached to the fencing. Tourists have secured locks to symbolize their love and then have thrown the key into the Seine River. As of last week, the fencing containing the locks have been removed for safety purposes and are going to be replaced with plexi-glass to hinder any lock placement. I loved seeing those locks in person and am grateful to be able to remember it by seeing photos in this book now that they will no longer remain. I’ve been to Paris over a dozen times but, after reading Michael Saint James’ book Bridges of Paris, I now realize how much I’ve missed. Michael and his wife spent a year in Paris learning French and exploring the different sets of bridges (there are over 300!) As a result, he was able to showcase the bridges during different times of the day and seasons. His book is separated into sections, according to where the bridges are located in Paris, i.e. island bridges, palace bridges, downstream bridge I’ve been to Paris over a dozen times but, after reading Michael Saint James’ book Bridges of Paris, I now realize how much I’ve missed. His book is separated into sections, according to where the bridges are located in Paris, i.e. island bridges, palace bridges, downstream bridges and upstream bridges. As I was examining the photographs I tried to imagine the different neighbourhoods surrounding these bridges. I found the layout of this edition to be practical and easy to follow. Each bridge has it’s own section featuring photographs (taken from different angles, seasons, depths of fields as well as closeups of the art and architechture of each bridge), history, facts about the bridge (dimensions etc.) as well as a satellite map with a yellow arrow pointing to the bridge’s location. I don’t think I’ve ever seen a book so meticulously prepared, it is indeed a labour of love. As a photographer working on my second book on photography, I understand the massive amount of work that went into the preparation of this gorgeous book. I love the covers (both back and front) (in addition to many of the lovely images). The penultimate image of the Eiffel Tower in the sunset is simply stunning! I began to write down all the images that I loved but found the list was getting too long! A treasure awaits you of the most spectacular photos of bridges in the City of Lights! Although, as I discovered, the real meaning behind the “City of Lights.” If it were possible, I would dive into these pages that illuminate the soul. The author has allowed us to witness his love affair with Paris. It was an enjoyment to read about the history behind these famous and some not quite so famous bridges. My favorite bridge is the “Pont Du Carrousel.” The architectural design has been deemed “old-fa A treasure awaits you of the most spectacular photos of bridges in the City of Lights! Although, as I discovered, the real meaning behind the “City of Lights.” If it were possible, I would dive into these pages that illuminate the soul. The author has allowed us to witness his love affair with Paris. It was an enjoyment to read about the history behind these famous and some not quite so famous bridges. My favorite bridge is the “Pont Du Carrousel.” The architectural design has been deemed “old-fashioned,” but that is what adds to its charm. A mystique surrounds the allegorical sculptures with the Seine speaking the most to me. They represent “Industry, Abundance, Paris, and the Seine.” And the pink glow of sunset that encompasses the bridge is simply breathtaking. The author’s love affair will stand the test of time. I witnessed such romance in these photos of bridges in the City of Light. One thing is for certain, James clearly made me fall in love with Paris all over again with his brilliant, masterful, digital photographs of the Parisian architecture. Just when I thought I couldn't possibly fall more in love with Paris, I do. This book is not only beautiful, but it is of pure heart. As I flipped through the pages I could feel James's enthusiasm and love for the city's bridges and I will never at Paris the same way again. The book itself is flawless. I loved the overly, large size One thing is for certain, James clearly made me fall in love with Paris all over again with his brilliant, masterful, digital photographs of the Parisian architecture. The book itself is flawless. I loved the overly, large size as it was rustic and allowed for the ideal view for the reviewer viewing the photography. As for the photography it glistened with new life and of passion that reflected Paris perfectly. I think the details in the photography is what really drew me to reviewing this book as I have never witnessed nor imagined Paris in such a glimmering light. Amazing book about the bridges of Paris! At first glance "Bridges of Paris" looks like a book of nothing but pictures, but don't let that fool you it's filled with information about the 37 bridges over the Seine. I was thrilled to see the insert about each bridge (the length and when it was built) it's just a nice tidbit of information to have access to. This book gives you just enough information about each bridge to peak your curiosity. My favorite bridge that was showcased in this book hands Amazing book about the bridges of Paris! At first glance "Bridges of Paris" looks like a book of nothing but pictures, but don't let that fool you it's filled with information about the 37 bridges over the Seine. I was thrilled to see the insert about each bridge (the length and when it was built) it's just a nice tidbit of information to have access to. This book gives you just enough information about each bridge to peak your curiosity. My favorite bridge that was showcased in this book hands down is the Pont De L'Archeveche. The story behind that bridge is breathtaking and the fact that lovers go there to attach a lock and throw away the key is so romantic. The pictures in this book are absolutely stunning. Taken from different angles, each picture tells a different story. This book left on your coffee table is sure to peak everyone's interest. Bridges of Paris is a beautiful coffee table book that is a tribute to the bridges in Paris. I had no idea there are so many and that they’re all so different! I could tell that the author put his heart into this book. Not only are there gorgeous photos of the bridges and the scenery around them, including pedestrians, but at the beginning he explains how this book came about and there is a history of bridges in Paris. Along with the photos I received a free copy of this book for an honest review. Along with the photos of each bridge and its surroundings is a short description and history of the bridge. There is also a small map of Paris for each bridge showing exactly where it is. This would be a great resource when traveling to Paris, although I think I’d make copies to bring since it is a heavy book. Bridges of Paris makes for a beautiful coffee table book. The book is solid and has a lovely cover. The contents include historical information on the bridges and rivers of France and specifically Paris, such as information on bridges build in the middle ages, the renaissance, etc. as well as the photographer’s own experiences in Paris taking the photographs. The real stars of the book, though, are the pictures. Saint James pictures are wonderful, and captures the bridges, the surrounding touris Bridges of Paris makes for a beautiful coffee table book. The book is solid and has a lovely cover. The contents include historical information on the bridges and rivers of France and specifically Paris, such as information on bridges build in the middle ages, the renaissance, etc. as well as the photographer’s own experiences in Paris taking the photographs. The real stars of the book, though, are the pictures. Saint James pictures are wonderful, and captures the bridges, the surrounding tourists and the city, and really the life of Paris. I was lucky enough to visit Paris years ago, and having such a nice set of pictures lets me explore the wonderful city all over again. I think this is a great book for anyone wanting to recapture that experience (or experience it for the first time through photos). My pictures really pale in comparison. This is definitely staying out where I can see it everyday. I received this magnificent book from Goodreads in exchange for an honest review. It contains the most beautiful photographs of 37 bridges in Paris, along with a history of each bridge. Included in the book is a map of Paris that shows the location of the bridges. The author's photographs capture the beauty of the bridges during changing seasons and different times of the day. Through these pictures the reader will appreciate bridges in a different way and realize that they are not just thorough I received this magnificent book from Goodreads in exchange for an honest review. It contains the most beautiful photographs of 37 bridges in Paris, along with a history of each bridge. Included in the book is a map of Paris that shows the location of the bridges. Through these pictures the reader will appreciate bridges in a different way and realize that they are not just thoroughfares, but an integral part of the beauty of Paris. The city will become a destination for you after exploring this book. I will be looking at the photographs in this book and exploring each bridge until I can travel there and see them for myself. Bridges of Paris is a rare treasure! I received this book though first-reads in exchange for an honest review. This book is beautiful! I was surprised when it arrived in the mail to find that it is huge and contains tons of gorgeous photographs of Paris. The accompanying text was informative as well as intriguing. I enjoyed this book very much! VERDICT: Gorgeous coffee table book on Paris that will both delight your guests and teach them lots of fascinating facts on Paris history. I won this book through the giveaways. It is an awesome book. Beautiful photography in a huge book. Michael Saint James has over 30 years experience as a photographer, educator and world traveler. He is an expert speaker on Impressionist art and has taught art to both college and elementary school students. Michael has visited 48 countries, Antarctica and lived in Japan, Cyprus, Jerusalem and Paris. He is an award-winning book designer and self-publishing consultant. Find out more at: http://www. Michael Saint James has over 30 years experience as a photographer, educator and world traveler. He is an expert speaker on Impressionist art and has taught art to both college and elementary school students. Michael has visited 48 countries, Antarctica and lived in Japan, Cyprus, Jerusalem and Paris. He is an award-winning book designer and self-publishing consultant.